The accounting process relies on the use of the accounting equation, which is Assets = (Liabilities + Owner's Equity). To accurately reflect a company's financial position, the two sides of this equation must always stay in balance. To accomplish this, accounting entries consist of two sides or a double entry. Each of the accounts in this equation show on a company's balance sheet and accountants use debit and credit entries to record transactions to each account. Double-entry accounting has been in use for over 600 years and was first seen in use by banks and merchants in Italy. True to its name, double-entry accounting is a standard accounting method that involves recording each transaction in at least two accounts, resulting in a debit to one or more accounts and a credit to one or more accounts. The total amount of the transactions in each case must balance out, ensuring that all dollars are accounted for. Debits are typically noted on the left side of the ledger, while credits are typically noted on the right side. Publicly-held firms must use the double-entry system of accounting, as it's required by law. Public companies must follow the accounting rules and methods dictated by generally accepted accounting principles (GAAP), which are controlled by the nongovernmental entity, Financial Accounting Standards Board (FASB). 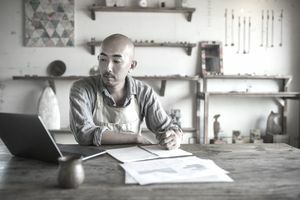 Double-entry accounting also serves as the most efficient way for a company to monitor its financial growth, especially as the scale of business grows. As a company's business grows, the likelihood of clerical errors increases. Although double-entry accounting does not prevent errors entirely, it limits the effect any errors have on the overall accounts. Because the accounts are set up to check each transaction to be sure it balances out, errors will be flagged to accountants quickly, before the error produces subsequent errors in a domino effect. Additionally, the nature of the account structure makes it easier to trace back through entries to find out where an error originated. When you employ double-entry accounting, you will need to use several types of accounts. Below are some key account types. Asset accounts show dollars associated with things a business owns, such as the cash in its checking account or the price paid for its warehouse. Liability accounts show what the firm owes, like a building mortgage, equipment loan or credit card balances. Income accounts represent money received, such as sales revenue and interest income. Expense accounts show money spent, including purchased goods for sale, payroll costs, rent, and advertising. The double-entry system requires a chart of accounts, which consists of all of the balance sheet and income statement accounts in which accountants make entries. A given company can add accounts and tailor them to more specifically reflect the company's operations, accounting and reporting needs. Most accounting software for business uses double-entry accounting; without that feature, an accountant would have difficulty tracking information such as inventory and accounts payable and preparing year end and tax records. The basic double-entry accounting structure comes with accounting software packages for businesses. When setting up the software, a company would configure its generic chart of accounts to reflect the actual accounts already in use by the business. Accounting software usually produces several different types of financial and accounting reports in addition to the balance sheet, income statement, and statement of cash flows. A commonly-used report, called the trial balance, lists every account in the general ledger that has any activity. The trial balance labels all of the accounts that have a normal debit balance and those with a normal credit balance. The total of the trial balance should always be zero, and the total debits should be exactly equal to the total credits. As an example of double-entry accounting, if you were going to record sales revenue of $500, you would need to make two entries: a debit entry of $500 to increase the balance sheet account called "Cash" and a credit entry of $500 to increase the income statement account called "Revenue." Another example might be the purchase of a new computer for $1,000. In this example, you would need to enter a $1,000 debit to increase your income statement "Technology" expense account and a $1,000 credit to decrease your balance sheet "Cash" account. The opposite also holds true: If your company borrows money from a bank, your assets will increase but your liabilities will also increase by the same amount. The double-entry accounting checks for accuracy because after completing your entries, the sum of the accounts with debit balances should equal the sum of the credit balance accounts, ensuring that you've captured both parts of the transaction. Do You Know Your Personal Net Income?